Finally! What you've all been asking for! 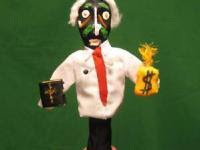 A one of a kind, handmade PAT ROBERTSON VOODOO DOLL. Ever wanted to cause Pat Robertson a massive headache? give him back pain? jab him in the crotch? Of course you have! Well then BID NOW to own your very own physical representation of the dark, dark soul of Pat Robertson. Accessories included with the doll are Pat's very own "HOLY" BIBLE and BAG OF MONEY taken from real Americans! WOW! Are these the final proof that acupuncture is pseudo-science? The man is a loathsome reptile. It is perhaps a shame for those of us in the sensible corner that we know that stabbing the doll will have no effect. I don't find that article and ensuing comments "interesting" except as yet another example of how supposedly educated clever people are happy to spout total twaddle. Even worse, they get paid for it! It has been relisted on eBay. Ironically, eBay took it down because it could not be verified that Pat Robertson's soul actually exists. Here's the new eBay link. It's over $670 again!